Home > View All Products > Peanut Butter Curl Baking Ingredient- 2 lb. Our delicious peanut butter sauce is truly universal in application! From ice cream sundaes to baked treats, this delicious old fashioned peanut curl sauce is sure to kick up any recipe a few notches. 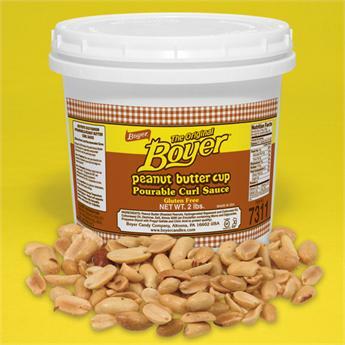 Also known as pourable peanut butter, Boyer Candy Company offers a peanut butter sauce which is perfect for ice cream, milkshakes, and other baking needs! Don’t forget to check out our recipes for a few ideas!